Ongoing projects and yarn mainly originating from the Yarn House in Caterham, Surrey. Having started this at the last knit & relax, I'm pleased with its progress. Aran weight does move fast and most of the rounds are one color. 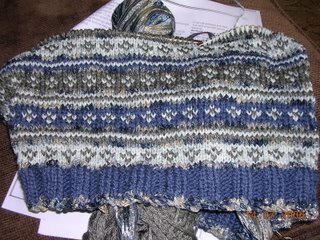 I'm about halfway to the underarm shaping and hoping to finish this before the move. It's looking great! The grey actually goes really well.